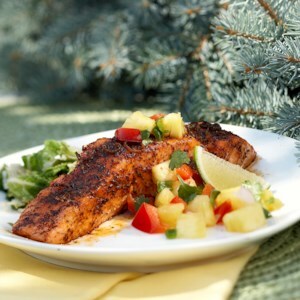 Find healthy, delicious grilled salmon recipes, from the food and nutrition experts at EatingWell. 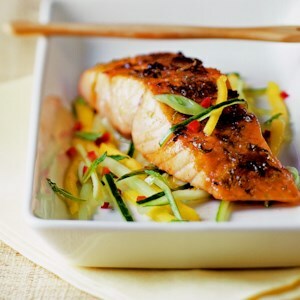 Hot pepper sauce and apricots add a zesty zap of flavor to salmon steaks in this 30-minute main dish recipe. 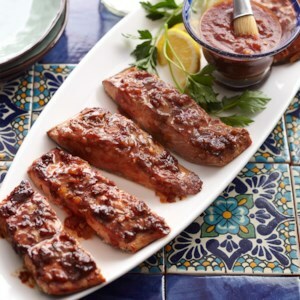 In this recipe, your grill does all the work! 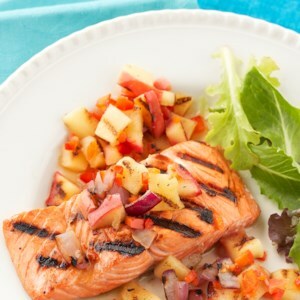 Apple slices seasoned with allspice and cardamom are grilled alongside sliced red onions and then combined into a delicious relish which is served atop grilled salmon fillets. Need a break from traditional beef tacos? 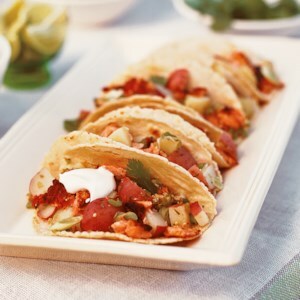 Try these salmon tacos for a heart-healthy dose of omega-3 fatty acids. They're bursting with tender potatoes, a lime-flavored green salsa, and lots of fresh cilantro in each bite. 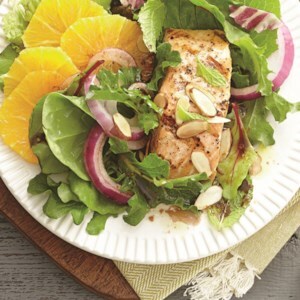 Using fruit pectin instead of oil makes for a fat-free dressing. 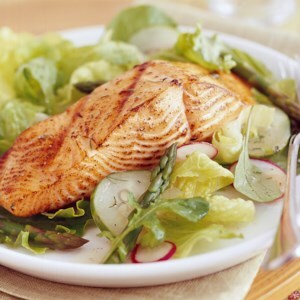 Try this dill-flavored oil-free vinaigrette on our grilled salmon and greens salad or use it on any other salad of choice. 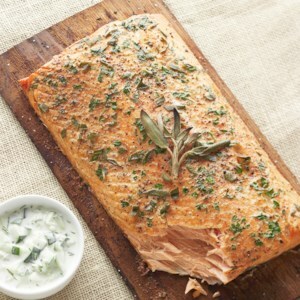 This delicious salmon fillet picks up a woodsy flavor as it grills atop a soaked cedar plank. Pair it with either the peppy blackberry sauce or the creamy dill sauce--or try both! The sauces can be served warm or cooled. 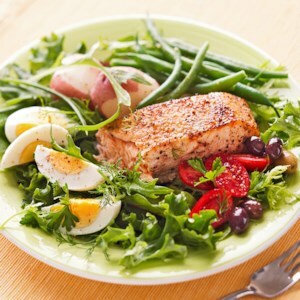 Grilled salmon filets add a nice dose of protein to this classic Niçoise salad. A simple lemon vinaigrette comes together quickly and really enhances the flavors in this healthy recipe. 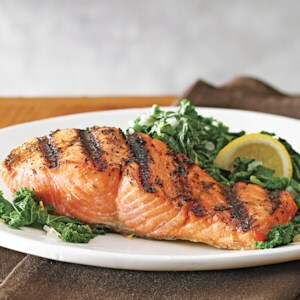 In this healthy dinner recipe, salmon fillets are seasoned with a zesty dry rub, grilled and served with a simple side--lemon-seasoned sautéed kale and shallots. Sometimes simple is best! 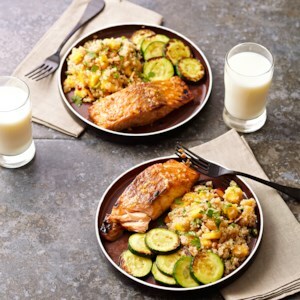 In this 30-minute dinner recipe, grilled, honey mustard-coated salmon is served with a tasty grain salad made with quinoa, mango, jalapeño and almonds. 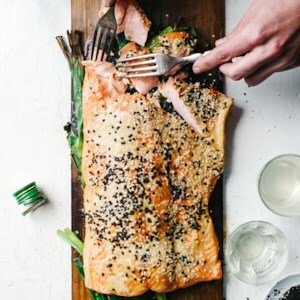 This maple-smoked salmon dish is sure to please your guests. 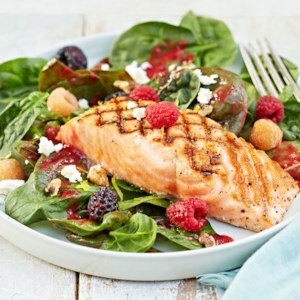 Incorporating salmon into salads adds a good source of protein and heart healthy omega-3 fatty acids. This quick-and-easy salad is perfect for a lunch or dinner and is sure to leave you feeling full and satisfied. 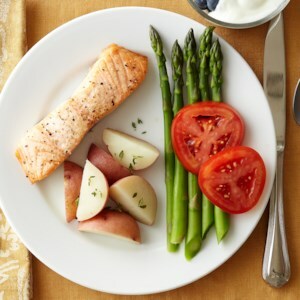 This quick-and-easy recipe is loaded with bold flavors and combines heart-healthy salmon with roasted or grilled asparagus. 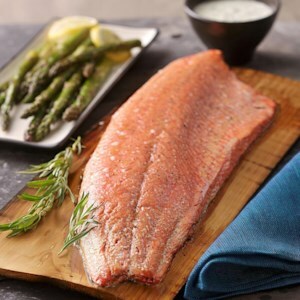 We recommend roasting or grilling the salmon and asparagus together to save time. To ramp up the flavor in this dish, use a dab of extra-virgin olive oil, snipped fresh parsley, finely shredded lemon peel, and ground black pepper. 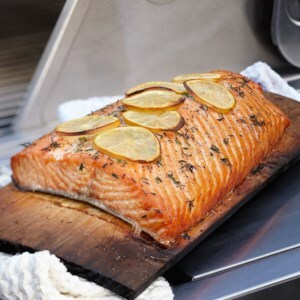 Grilling with a cedar plank gives the salmon a subtle smoky flavor. 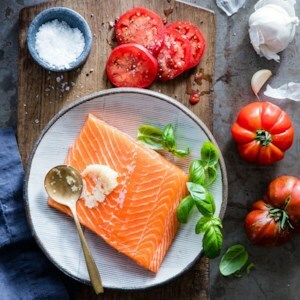 Besides adding smoky flavor, cooking salmon on a plank eliminates the triple pitfalls of grilling fish--drying out, sticking to the grate or breaking when you attempt to turn it. 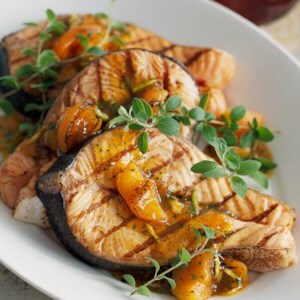 For this healthy grilled salmon recipe, the sweet-salty flavor of the miso-maple glaze counterpoints the buttery richness of the fish. 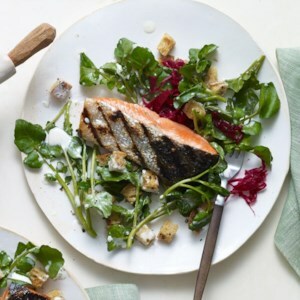 With a nod toward German cuisine, rye croutons, mustard and sauerkraut pair beautifully with this healthy salmon recipe. Most large supermarkets sell sauerkraut in the refrigerated section; if you can't find purple sauerkraut, feel free to use green (or make your own!). A rich dill-infused buttermilk dressing brings everything together in this healthy salad recipe. This recipe is so beautiful and yet so simple to prepare--it's perfect for entertaining. 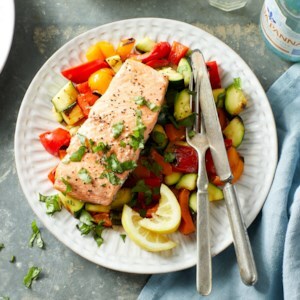 You just spread a side of salmon with minced garlic, sprinkle with fresh basil, then layer sliced tomatoes on top. Put it on the grill for 10 minutes and you're done!